In a tiny sweltering tin-roofed shack tucked inside one of Mogadishu’s bullet-riddled neighbourhoods, two brothers, Ali Hassan and Mustafa Yare, sit hunched over one of eight humming desktop computers. Together they show Nasteexo Cadey, a young veiled student at Mogadishu University, how to set up her Facebook account, browse YouTube videos and check her e-mail. For the past few months business has been growing at the brothers’ Kobciye Internet Coffee, one of the several makeshift Internet cafés that have emerged in Mogadishu since the Islamic militant group Al-Shabaab fled the city. “I wanted a business,” Hassan says, “and this is something that I’m good at. I have skills in computers and IT.” With staggering unemployment and few opportunities for youth, any job is a good job, he says. The café costs around $600 a month to run, and the brothers manage to bring in around $1,000 from their 40 or so daily customers, mostly university students. Although Somalia’s Internet penetration still stands at just above 1% of the population — similar to Afghanistan’s — demand in Mogadishu is growing rapidly. As in the rest of Africa, youth hungry for content, connectivity and change are driving the demand. For millions of unemployed yet tech-savvy youth across Africa, increased connectivity is bringing tremendous opportunities. By tapping into the continent’s growing digital revolution, young entrepreneurs are using information and communications technology (ICT) to boost their own prospects. “ICT brings tremendous opportunity” to Africa’s youth, argues Ahmed Alfi, chief executive officer of Sawari Ventures, a venture capital firm in Egypt that focuses on new technology. “With software development, there’s nowhere else you’ll start with a thousand dollars and end with a million. It’s one of the few times in history those types of returns are available,” he told Africa Renewal. While an Internet café may not itself be a million-dollar business, what’s created in it very well could be. Over the past five years, fibre-optic cables and a backbone network to support them have connected the continent in unprecedented ways, slashing the cost of Internet access and opening up new markets for content, software, mobile phone apps and social media. 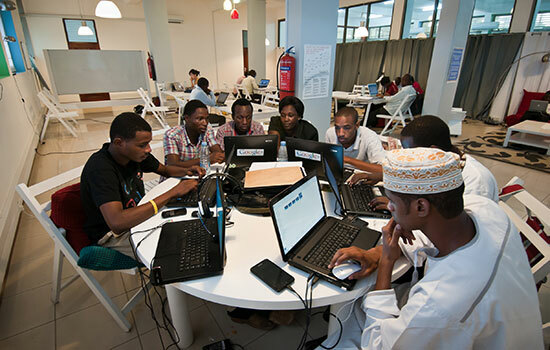 From Somalia to Ghana, Dar es Salaam to Dakar, Cape Town to Cairo, Africa’s youth are finding ways to use ICT to drive growth, build businesses and shape their futures. To understand Africa’s digital opportunity, one only has to look at the numbers: six out of the 10 fastest-growing economies are in sub-Saharan Africa. Africa is the second-biggest mobile market in the world — smartphones outsell computers four to one. Over the 18 months to February 2012, Facebook had a user growth rate of 165% in Africa, according to the blog ICTworks. Five years ago, BusyInternet, West Africa’s largest Internet provider, opened an Internet café in Ghana’s capital, Accra. It had a lounge featuring 100 computers, and Ghanaians from all walks of life would pay about 50 cents an hour to use its high-speed connection. With Internet penetration in Ghana at about 10% in 2011, according to government statistics, BusyInternet was one of the few places young folks could go to get online. Many of Ghana’s young tech entrepreneurs and bloggers used the space to learn — online and from each other — and to shape a young tech community. They held BarCamps (informal networking forums for young techies) and founded BloggingGhana, a community of bloggers with a passion for Ghanaian content. By 2008 it was clear that Accra’s vibrant young tech community needed more institutional development. This led to the founding of Meltwater Entrepreneurial School of Technology (MEST), which offers a two-year programme on training and mentoring for aspiring African software entrepreneurs. Successful companies have emerged from MEST, including NandiMobile, which provides mobile marketing and customer support for local businesses. Nearly all the entrepreneurs at MEST are in their mid-twenties. Yet business is not the only thing emerging from Ghana’s young tech scene. @GhanaDecides, a movement monitoring Ghana’s elections via social media, received international acclaim during the run-up to Ghana’s 2012 general election for fostering a better-informed electorate. It advocated free, fair and safe elections. It ran online election-related campaigns and provided offline social media training for youth groups, civil society organizations and public institutions. BusyInternet’s “hub” effect in spurring Ghana’s tech-centric youth into action is not an isolated case. It reflects a pan-African movement towards technology hubs that encourage the formation of communities and empower young developers and entrepreneurs. Erik Hersman — co-founder of software company Ushahidi and of Nairobi’s iHub, one of the best-known hubs in Africa — claims that the continent is undergoing a “tech-hub boom.” There are now more than 90 hubs, labs, incubators and accelerators in Africa, covering more than 20 countries. According to recent research, African hubs are springing up at the rate of nearly one every two weeks. “The tech hubs in Africa provide a home for those with new and innovative ideas, create an atmosphere where they are encouraged to try new things and, most importantly, are able to meet like-minded individuals they can grow with,” says Mr. Hersman. iHub emerged from the success of Ushahidi’s software platform used to capture and monitor citizen reporting during Kenya’s post-election violence in 2008. Started in 2010, iHub now has over eight thousand members spread across the world, with dozens of people using the space regularly. Nearly 75% of people using iHub are working in or developing startups, according to a recent report by iHub’s research branch. Many of these startups have a social mission, like eLimu, which is distributing e-learning tablets to improve education in Kenya’s primary schools under a pilot project. Others, such as Niko Hapa, a location-based loyalty card for businesses accessed through a mobile phone, are purely market-driven. A thousand kilometres away in Kigali, Rwanda, a new government-sponsored ICT hub called kLab also targets young software developers and recent college graduates, offering them a place to gain practical experience and training and to work collaboratively. Rwanda, a small, poor, landlocked country, is striving to build a knowledge-based economy. It has put ICT development at the centre of its Vision 2020 — President Paul Kagame’s plan to turn Rwanda into a middle-income country by 2020. In line with that vision, the youth are to lead the charge. Jean Niyotwagira, a young Rwandan and one of kLab’s first “tenants,” who graduated with skills in computer engineering last year, has already founded several software companies. These include a mobile applications development company, a social networking platform company and a digital supply-chain management platform company. An ability to “try and fail” is a key advantage. In the past, failure usually meant economic disaster for young entrepreneurs, but now these hubs provide crucial support that enable entrepreneurs to take more risks, and either reap the rewards or start over again. While bustling hubs packed with fresh ideas and idealistic entrepreneurs exist across the continent, one thing does not — investment. Many entrepreneurs struggle to get their companies past the initial seed-funding stage, since few local investors seem willing to take risks on technology ventures with potential for high profits. “We need more tech-savvy investors,” Mbwana Alliy, a former Silicon Valley entrepreneur who now manages the Savannah Fund, a Nairobi-based investment fund specialising in high-growth technology, told Africa Renewal. But the blame lies not just with investors. It also lies with the entrepreneurs themselves. Mr. Alliy complains that many young entrepreneurs are “unfocused” and “lack discipline.” They may be great developers, but they do not have the skills to build and manage a company. Although people can learn software-coding skills online quite easily, learning the ins and outs of business management and finance is not so easy — in this, Africa still faces an enormous talent deficit. Many hubs are now turning their attention to helping entrepreneurs build such essential skills. Despite the challenges, youth across the continent are getting connected and creating opportunities for themselves. Whether it’s safely inside Africa’s hubs or along the bullet-pocked streets of Mogadishu, they are finding ways to use technology to innovate, create employment and improve the societies in which they live.